The renderings feature an interior, gate entrance and aerial view of the possible MLS stadium and park. 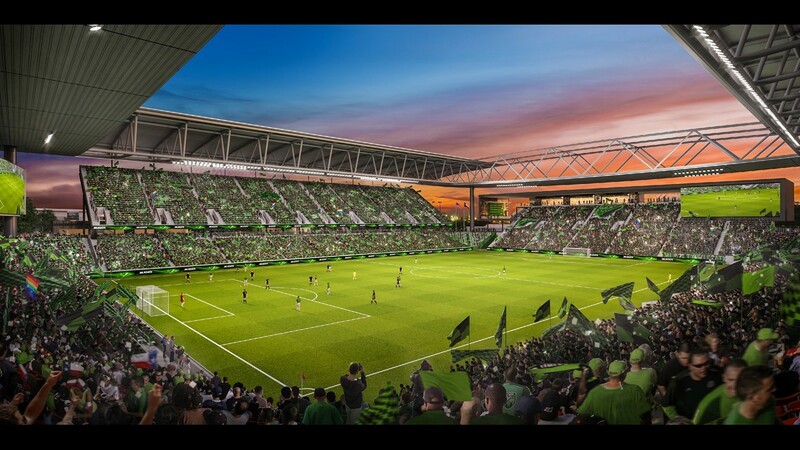 AUSTIN — We now know what Austin's potential Major League Soccer stadium could look like, thanks to conceptual renderings released by Precourt Sports Ventures Thursday. The renderings, which were designed by Gensler Sports Practice, TBG and the Creative Artists Agency, feature an interior, gate entrance and aerial view of the possible MLS stadium and park. "We're super thrilled to share that with Austin. 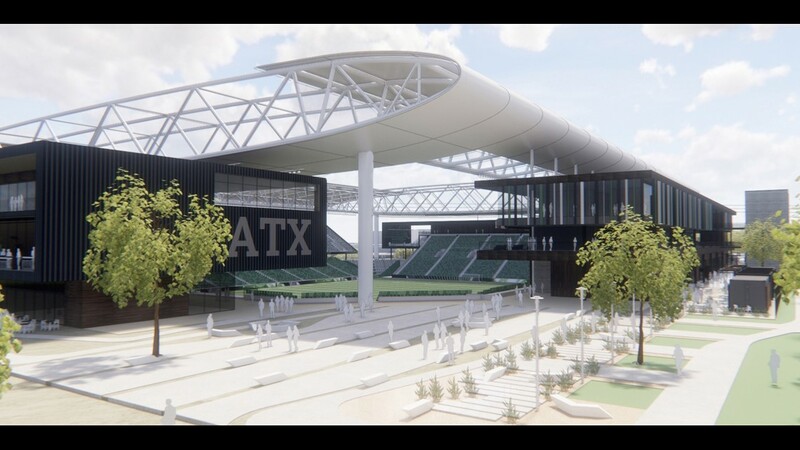 We've been analyzing the market for quite some time, and here's what we know: Austin wants soccer, they're ready for their first major league team, and this is just a chance for us to really bring these images to life. 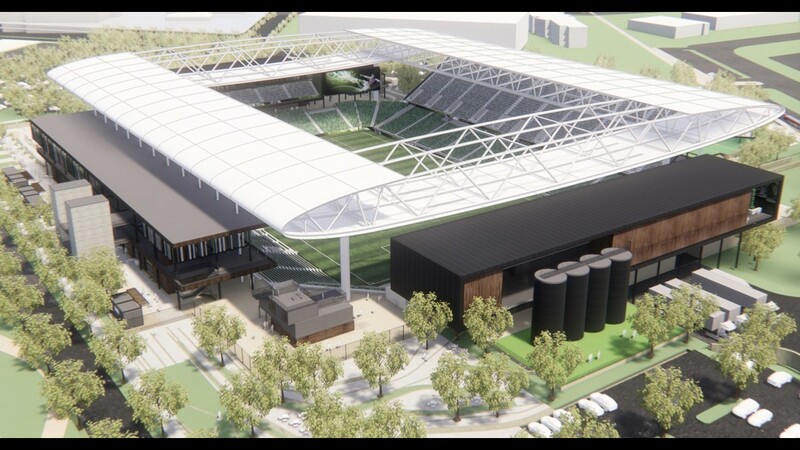 They are conceptual in nature, but we have a really good sense of what the Austin soccer fan wants," said Precourt Sport Ventures President Dave Greeley. "We really think it's a dynamic package, and we wanted to bring it to life with some of these renderings." PSV recently unveiled a site plan for the possible MLS stadium indicating that the stadium will sit on almost 25 acres at McKalla Place in North Austin. Greeley said they will officially give their proposal to the city Friday. "This isn't a perfect scenario, we don't have a lot of sites to choose from, McKalla place is kind of the site, so we're hopeful," said Greeley. Greeley told KVUE they would privately fund the $200 million stadium, and the land would remain city property. "It's a great gathering spot for all of Austin," said Greeley. The stadium would have a canopy, which Greeley said would provide shade, and keep noise in. "If you're a soccer fan, you're going to love the experience because first and foremost you're going to be on top of the action," said Greeley. The 24-acre property would also have park space, music and performance areas and a pond. While it would also have 1,000 parking spots, some worry that's not enough for 20,000 fans. "They can walk, they can ride their bike, there's 500 bike spots, valet, it's great for ride sharing. There's about 10,000 parking spots in a 15- to 20-minute walk, which is great," said Greeley. Others are concerned about traffic, but Greeley said the games will likely be during non-peak hours, like weekends and Wednesdays at 8 p.m.
"We clearly recognize Austin's mobility challenges," said Greeley. He feels it could actually provide traffic for nearby businesses. "We think not only is it going to be a great atmosphere in and outside the building, but in all the surrounding areas as well where businesses can take advantage of the excitement, frankly the economic vitality that this project's going to bring," said Greeley. "It's a live, work, play area, and we know this is going to be good for local businesses." "McKalla place is a high opportunity spot, and a high opportunity part of town," said Ed English, who has lived in the North Austin area for 35 years. But the opportunity he sees is different. "We need some affordable housing out here and that's an absolutely ideal location for it," said English. "Every check box that you would want to check for a desirable location for affordable housing, you have at that location." He said the land is surrounded by businesses which he believes translates to jobs, as well as transportation routes, grocery stores and elementary schools. "I don't know what more you could ask for as far as an ideal location for affordable housing and the city happens to own the property," said English. "We talked a good game for a long time and here's an opportunity to do something." Monica Guzmán, the chair of the Rundberg Revitalization team, agrees. "Affordable housing is usually number one on what needs to be addressed by the city for their property," said Guzmán. "I don't like the idea personally of a soccer stadium going in there, it's city owned property, it is paid for by the taxpayers." She feels there needs to be more community input. "We want to see a transparent competitive process there are other, there are developers out there who are interested in it for mixed use, housing, they should be part of that conversation with the city," said Guzmán. "What do the people want, most of the people I know, they love soccer, but they would rather have housing or something else." Both Guzmán and English said they're open to a soccer team and stadium, but want them located somewhere else. "If someone wants to bring soccer to Austin, I'll be there with open arms, but this is public property, and public property needs to go to efforts that benefit more of the community than just a soccer stadium," said Guzmán. Greeley said they hope to bring the team to Austin in March 2019, and open the new stadium in March 2021. Friday, the city is expected to release an economic development report on the impact of a soccer stadium at the McKalla Place location.